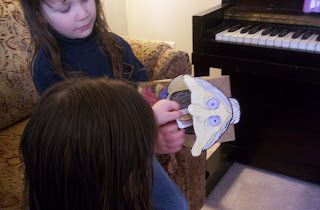 This is a post from last fall, but at the time I couldn't find the link I had used for printing the puppet head. Today, I finally found it - so I wanted to repost with the complete information. I was sorting through the kids' books last night, in search of The Night Before Thanksgiving by Natasha Wing, when I came across Alison Jackson's I Know An Old Lady Who Swallowed a Pie, instead. I was happy to find it, because there was an activity I'd been meaning to do with the little ones, involving this book, and with Thanksgiving closing in fast, it was nearly too late. 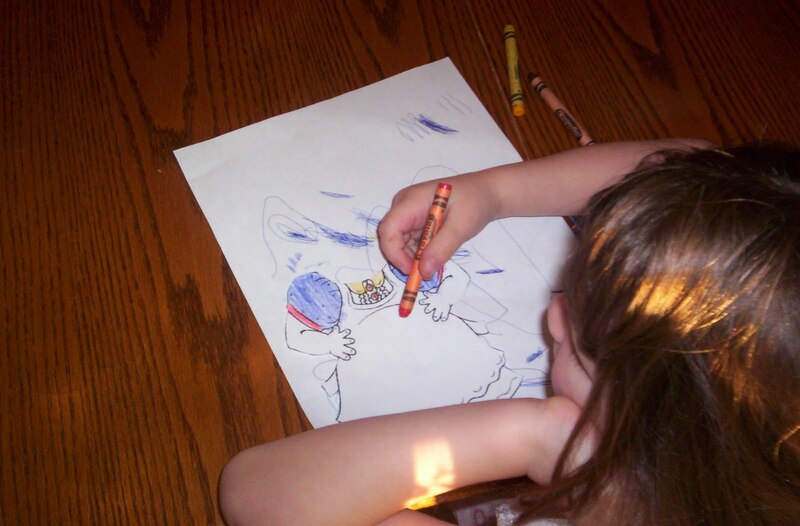 A few weeks ago, Michelle, over at A Mommy's Adventures, used the I Know An Old Lady Who Swallowed a Bat book, for a story and art project, and I knew right away, we'd have to do something similar with this book. So, this morning, I printed out a picture of The Old Lady from Marcia's Lesson Links, for the children to cut out and color. I decided to use a different face for the Old Lady, one that I thought looked a little more like the illustrations in the book. 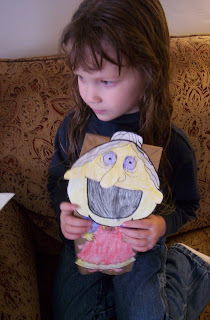 So, I printed the Old Lady Puppet from a Utah Eduction Network, probability page (It's the one listed under "The Hungry Old Lady Activity" heading). 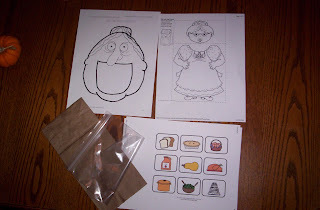 I also printed out pictures of the Thanksgiving food the Old Lady ate from Make Learning Fun. 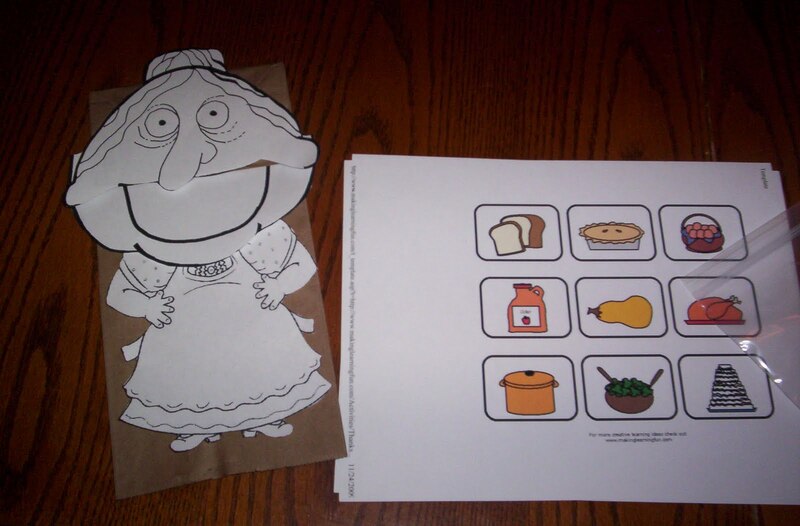 After the little ones colored The Old Lady we glued her to a lunch size paper bag, with a slit in the mouth for the food to go in. 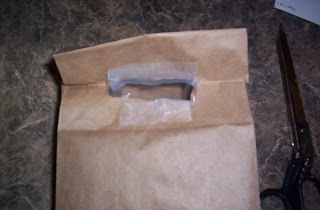 We taped a plastic Ziploc bag inside the paper bag, so it could catch the food placed into the puppet. 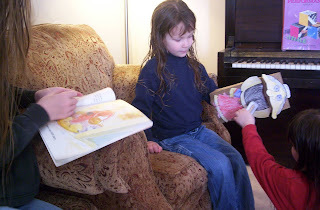 Finally, one of the older girls read the story, while the little ones placed the food into the puppet's mouth. Just in case you would like to do this activity, but can't get your hands on the book, there is a copy of the complete poem "I Know An Old Lady Who Swallowed a Pie", here. I still hope you found my book, The Night Before Thanksgiving, to read to the kids tonight! This is so cute! I've heard of the book, thank you for reminding me of it. I will have to see if I can get a copy from the library. Or we will go read the poem on line. I admit that I am not a big fan of "Old Lady" series with that "Perhaps she will die" line, but I kind of learned to tolerate them over time. We just read There Was an Old Monster by Ed Emberley. Ziplock was really a nice touch, and I liked a very cute picture of your youngest in the end. So cute!! They did a great job with their coloring! I think we'll print one out too!! We have been enjoying this book too so I am going to print everything out right now. Thanks!!!! We are also fans of The Night Before Thanksgiving. I just recently discovered your blog. I love the ideas you share. I did this project with my 4yo today and she had a blast. It turned out really well and she is excited to share it with Dad tonight at story time. It looks like you guys had a blast! Thank you soo much for including links to templates. I've been looking for activities for this charming book.